Axpona 2019, April 12-14. Who is going? These are the people I know of that will be there. What booths do you recommend to visit? I went in 2016 and some of the booths I really enjoyed were Seaton Sound, JTR Speakers, Smyth-Research (demo the Realiser A16 if you can! ), HSU, Pioneer, Sennheiser, Salk, Parts-Express, and Emotiva. Looking forward to the event. Maybe we can use this thread to organize a lunch meal together with the AVSForum crowd one day during the event? @Jeff Permanian reached out to me and offered that I extend the invite to those attending to meet up in the JTR Speakers room (Nirvana C ballroom) to chat and meet and greet on Friday night after Axpona’s normal business day has drawn to a close. At 6:01-6:03 there will be a capability expo of the JTR system at full bore. You'll want to be there to experience this --- potentially with hearing protection. Phenomenal clarity at 130B? - The JTR are just getting warmed up. Then for the next couple hours - 6-8PM there will be a more reserved volume, free audition session/meet and greet. People can request specific demo material, or listen at their preference. At 8PM a full movie will be played on the JTR 9.8.6 Atmos setup - movie choice to be determined by vote of those present. There are about 25 chairs and plenty of standing room. Alcoholic beverages and food are allowed, but it is BYOB. markrubin, Marc Alexander, chucky7 and 2 others like this. Last edited by Archaea; 04-15-2019 at 04:14 PM. I’ll be there hopefully Saturday. A Vulgar Display of Nearfield Power 6-15's Slot Ported at 12.86 HZ. I wish I could come with you guys. Next year Jared we can plan something out for this months in advance. Reminder JTR has his Open House GTG Friday Night at Axpona. Please join if you can. Archaea and Mike_WI like this. Anyone have a pic or two to post from previous years? Just for those of us who haven’t ever been? Lots of pictures in this thread. @Scotth3886 who started the thread, and took a lot of the pictures, is probably going this year. I'm sure he'll chime in one way or the other at some point. Also, a shout out to @TuteTibiImperes who took a ton of the pictures. imagic, Jk7.2 and Scotth3886 like this. Last edited by drh3b; 03-22-2019 at 05:53 AM. Lots of pictures in this thread. @Scotth3886 who started the thread, and took a lot of the pictures, is probably going this year. I'm sure he'll chime in one way or the other at some point. Somehow, I screwed up the link, but it's fixed now. Oh wow I'm gonna REALLY regret not going this year! Yes, I started the thread as I have the last four years and I'm going for all three days. I'll bone up on posting from my phone PRIOR to getting up there this time. I've been in contact a couple of days ago with Mark Henninger regarding this year's show. We're doing pretty much the same format as last year since Mark isn't able to go. @TuteTibiImperes , are you going? imagic and drh3b like this. I'm looking forward to featuring member reports on the homepage and the newsletter! I'll ask the same question here that I just asked in the thread I started. I have zero interest in any of these brands on the HT side of the business and likely won't be reporting on them or even in the rooms. Should we have an high-end audio report and a HT report as two threads or combine? @imagic I think what might be best is keep the pre-show chatter in these two threads. However, on show day, Mark, open a new article on the homepage with one thread being HT related and the other audio and everyone post their show report comments on whichever thread they think is most appropriate as there is a little bit of crossover. What do you think? Last edited by Scotth3886; 03-22-2019 at 06:31 AM. That sounds good to me. Agree, little to no crossover appeal between the two camps. Boom! Can't wait to hear my first demo of the funky pups. I will be there Friday and Saturday ......looking forward to my 5th year! SOWK, where is the open house? Its unfortunate you feel that way, as JTR Speakers, Seaton Sound Speakers, JBL M2's sound significantly better than any audiophile speakers I have heard in the same price brackets. You are doing yourself a disservice to be honest. I know from personal experience that the JTR 215RT speakers and Seaton Sound Cat 12's surpassed my Vandersteen Quatro's in almost every regard. giomania and Archaea like this. Last edited by SOWK; 03-27-2019 at 04:52 AM. I absolutely agree, JTR and Seaton are pegged as home theater speakers but effortlessly deliver the kind of fidelity (IMO) many high-end systems wish they could. And the M2 is science, what I heard them do in a studio is astonishing. Marc Alexander, giomania, Archaea and 1 others like this. Also, I see JTR is providing the speaker equipment for the two live concerts at Axpona. Marc Alexander, giomania and Mike_WI like this. Well, I hugely hugely disagree to the point that I couldn't disagree more. In fact, they make me leave a room. So there you go … why you post in the HT forum and I do in the 2 channel audio forums. But the best time for fun seekers and bass lovers! Mike_WI and corradizo like this. Last edited by SOWK; 03-27-2019 at 06:06 AM. While I agree the focus in the HT demo rooms is vastly different that what you might be going for specifically. I would recommend you find a local user around you, that will demo them for you in a less extreme way. Dood, leave it alone! Been around this stuff for six+ decades, and going to live, unamplified events since 1947. Just about everyone in my geezer neighborhood have HTs, but me. I've been in social situations where we end up in their HT rooms, but I excuse myself as soon as I can. I don't and haven't gone to commercial theaters for about 20 years mostly because of the sound. We actually rent them out in the morning for CRE meetings and we can stay for the matinees if we want, but I'm out of there in about five minutes. I came very close to leaving the AXPONA Saturday night blues concert a couple years ago at the old location because of the sound. I don't need to name names of the PA speakers because you know who it is. I quit going to local jazz venue/bar here in C-Bus, Natalie's, because of the PA speakers. I lived in LA for 30 years and have likely been to much of what's in that metro. I've been to Yoshi's in Oakland a few times so it's not that I haven't been exposed. If you like it, fine. Me, I just leave. 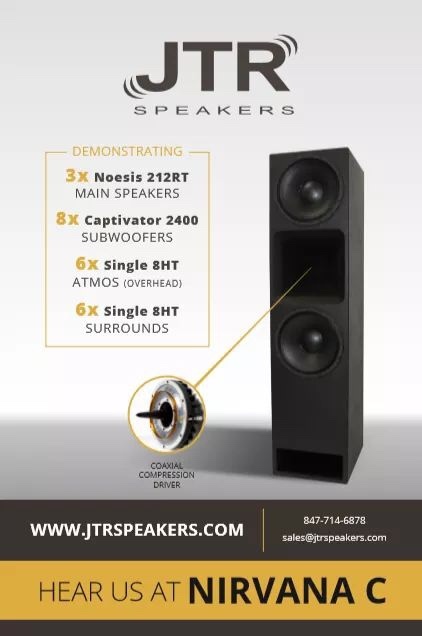 If you are up to it on early Friday/early Saturday, I could get you a special demonstration of the 212RT's in a much more audiophile focused demo. You could even bring some material you really enjoy on a USB drive if you are wanting to hear something specifically. Unfortunately Jeff will not have a vinyl setup. But we can play DSD, and High Res Digital Audio if you bring it. I'm sure Jeff has a ton with him as well. Jeff would just ask you to have an open mind. Thanks, appreciate the offer, but I'll pass. I have been in the HT rooms the last several years. Not pleasant, IMO. Not that they aren't fine affable fellows, but its a paradigm that gets as far as possible from anything I'm interested in. Even met Mark Seaton's dad last year. Great guy. And yes, I'll have a USB drive and my phone ready to go with Tidal so I'll be equipped. I'll be at AXPONA 2019. Hope to get there Friday after work for JTR demo. Will stay overnight and leave Sat afternoon.